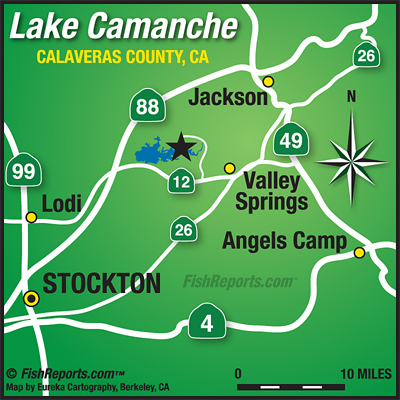 There have been some awesome reports about Lake Camanche recently. So instead of reporting about the great bite on the lake I’d like to let you all in on what I learned fishing with Ron Howe. First off, I want to say I was very excited to get a chance to fish with another tournament angler that has been as successful as Ron. He is coming off a championship win where he won $20,000 in cash with his team partner Bob Miller. Now that is quite an achievement considering the caliber of Anglers here on the West Coast. With each of us having more than 20 years experience in tournament fishing, the anticipation to see how he would approach the lake verses the way I would was building! After a short amount of time on the water I realized that we fish with very similar techniques, just at a different pace. For starters, it was impressive watching how fast Ron adjusted to the day always trying to figure out how to get the Bigger Bites. I have a tendency to spend a little more time on a bait that is working to see if the bite will pick back up. Take the A-rig for an example, the first few fish came on that technique, but after about half hour without a bite I noticed that Ron picked up a Senko. He made a couple of casts but still no fish. A short time later he put that down and picked up a tube bait and got a fish right away! Mean while, I was still throwing the A-rig chasing a Big Bite. Then right after Ron caught the Tube fish a nice Spotted Bass, he put it down and was throwing a Jig. Quickly Ron boated a nice Spotted Bass on the Jig. Then he was back to throwing the A-Rig. We pulled up on a flat and out came the crank bait, Ron made 20-30 Casts with no success. Ron would make changes depending on the structure and depth we were fishing throughout the entire day. I made my switch to the tube bait shortly after Ron got a couple bites. When the bite slowed down on the A-Rig and the Jig bite was not gaining any steam, Ron switched between a darthead and dropshot. What was interesting is Ron did this when the wind picked up. Ron caught a 3lb Spotted Bass Right away, then two Largemouth up to 3.5lbs and then he stuck a 5lber all on the darthead. Now His approach on changing it up is very much like mine, but as I said earlier the pace was different. He made his changes between baits faster than I do but it was nice watching first hand the benefits of the quick change ups! So it was my turn I borrowed one of Rons worms and shortly after I stuck a nice 5lber! 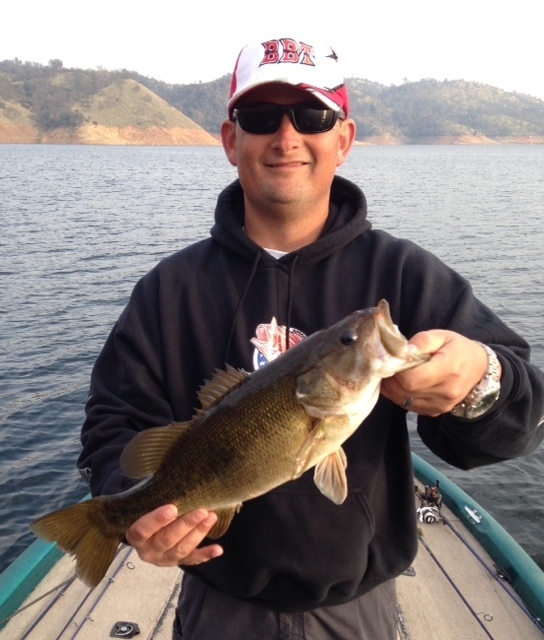 Fish biting is always wanted whether you’re fishing for fun or in a tournament for the big one! I’m not trying to tell anyone how to fish but remember keeping an open mind and trying different techniques can make the difference in having a good day or a great day! I enjoyed having the opportunity to fish with someone that loves to fish as much as I do. The day on Camanche was just another reminder that no matter how many years someone has been fishing, there is always something new to learn about this amazing sport! 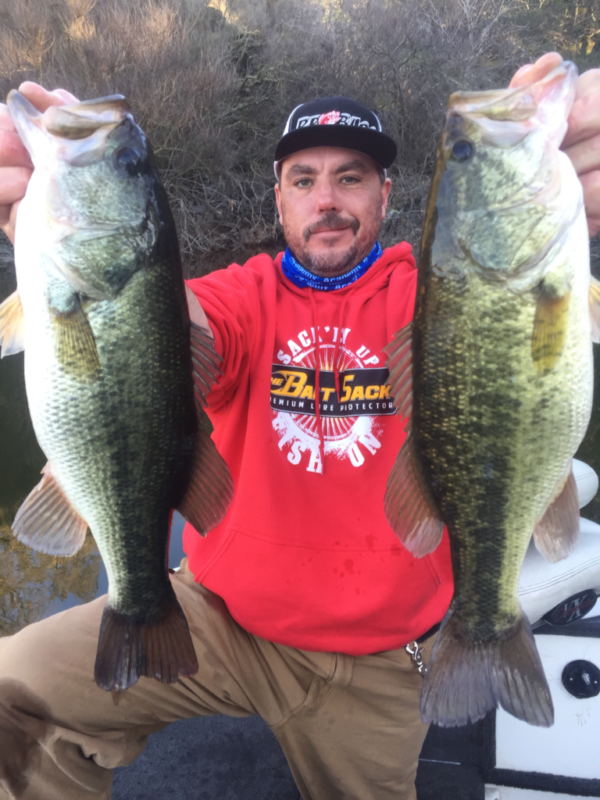 Remember that rbbassfishing.net is great place to go to stay up to date on great information about any body of water that you are interested in fishing soon. I hope everyone has a wonderful Christmas and a Happy New Year! Thanks to the all the great company’s that support me.